LITHIUM TOXICITY IN ELDERLY-A CASE REPORT AND DISCUSSION. Department of Psychiatry, Medical University, Varna, Bulgaria, Third Clinic of Psychiatry, University Hospital "St. Marina", Varna, Bulgaria. Background: The therapeutic effect of Lithium as a mono therapy or as an augmenting agent in a variety of medical and psychiatric disorders is under doubt. However, lithium is associated with a number of adverse effects. Method and objective: A review of the literature on lithium use in older adults and a case report presentation. Summary of results: The literature, concerning current uses of Lithium in older patients, especially for patients with neurologic or cognitive impairments is limited due to the lack of well-designed, large clinical trials. Elderly patients are at higher risk to develop neurotoxicity in the course of lithium therapy. We present a case of 66 years old female patient, suffering bipolar disorder, who developed lithium toxicity and was admitted at the gerontopsychiatric department due to a confusional state, tremor and gait abnormality. Lithium toxicity was suspected when sufficient information about previous medical history of lithium therapy has been obtained. Lithium level found to be 1.69mmol/L. The patient has developed intoxication during maintenance therapy with a lithium dosage which had been unchanged for months. Conclusion: Elderly patients require lower doses of Lithium to achieve similar serum concentrations as those in younger adults. Neurotoxicity could be suspected at serum lithium levels which are considered therapeutic in younger adults. When prescribing lithium agents in elderly we should consider age-related changes in pharmacokinetics. The best way to prevent lithium toxicity is to control the serum concentration regularly during therapy. Arnaoudova MD. Lithium toxicity in elderly - a case report and discussion. J of IMAB. 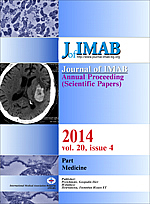 2014 Jul-Sep;20(4):519-522. doi: http://dx.doi.org/10.5272/jimab.2014204.519. 2. Baldessarini RJ, Tondo L, Davis P, Pompili M, Goodwin FK, Hennen J. Decreased risk of suicides and attempts during long-term lithium treatment: A meta-analytic review. Bipolar Disorders. 2006 Oct;8(5 Pt 2):625–39. [PubMed] [CrossRef]. 13. Busko M. "Normal" Serum Lithium Levels Might be Neurotoxic in Geriatric Bipolar Disorder. Medscape. Mar 20, 2008. 15. Murray N, Hopwood S, Balfour DJ, Ogston S, Hewick DS. The influence of age on lithium efficacy and side-effects in outpatients. Psychol Med. 1983 Feb;13(1):53–60. [PubMed]. 18. Menghini VV, Albright RC Jr. Treatment of lithium intoxication with continuous venovenous hemodiafiltration. Am J Kidney Dis. 2000 Sep;36(3):E21. [PubMed].